Anyone can stick some Lego bricks together to make … something. 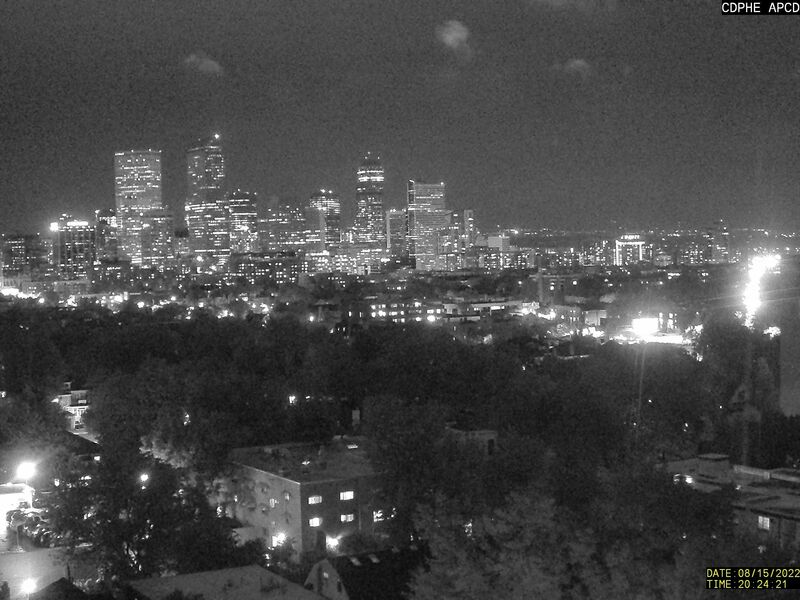 But few people have elevated the pastime to an art form. Notable among them is Nathan Sawaya, a one-time lawyer whose Lego sculptures were so much in demand that he became a full-time Lego artist. 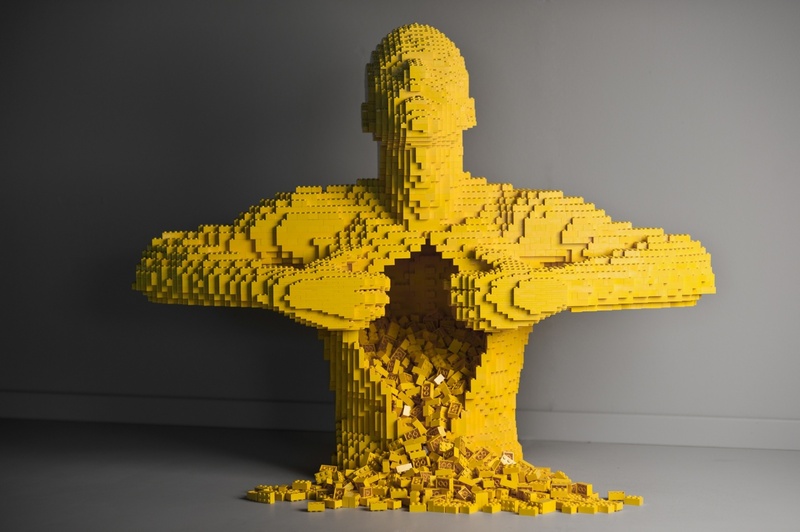 His best known sculpture, “Yellow,” made from 11,014 bricks, is about baring his soul and the difficulty he had moving away from the corporate world. He says he enjoys the fact that while adults appreciate the anguish depicted, kids fixate on the spilling guts. Sawaya has studios in Los Angeles and New York and spends about 10 hours a day clicking bricks. His work has appeared in Bill Clinton’s presidential library, on a Lady Gaga album cover, and in a New Orleans’ public monument to Hurricane Katrina. Eighty of Sawaya’s sculptures will be on display in London’s Old Truman Brewery from September 26 to January 4. The Guardian has more photos and a story. 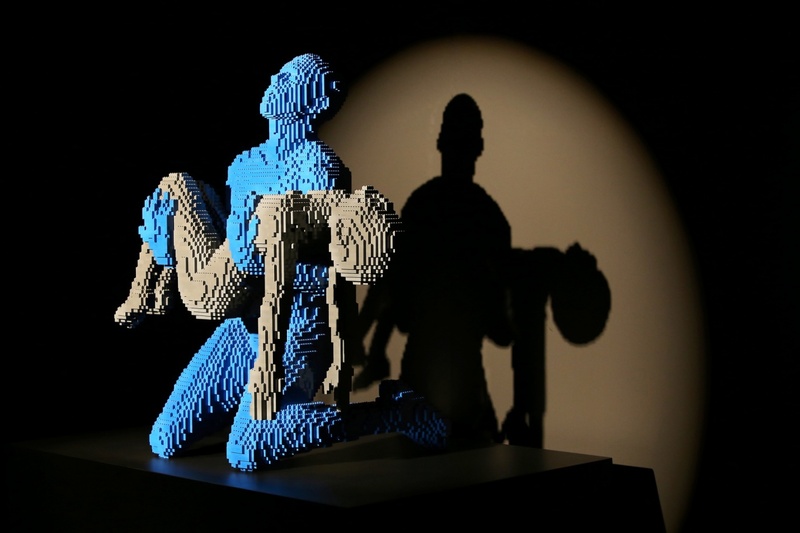 “My Boy” (22,590 bricks) is Sawaya’s reaction to the story of a parent who had lost a child. ‹ Iodine: Just what the doctor ordered? Pretty amazing. I think I made a little house once …. I’d have to borrow some from my grandkids. But I’m afraid practice wouldn’t help much. Never imagined Lego blocks could become an artist’s medium. How did you find this? And, a better question, are you going to give it a try?? Thanks for a cool wake-up post! The Guardian is one of the places I regularly visit for news and the top picture was hard to miss. Me, give it a try? Heh, not likely. For starters, I can’t afford that many Legos! I used to go around to garage sales and buy all the Legos I could find. We have tubs of them. Best toy/entertainment ever created. Tons of Legos at my son’s house, of course. I’ll bet Lego gives Sawaya all the Legos he needs. I’ve been wondering what, if anything, he does to make sure his sculptures don’t accidentally come apart. If I’d created something like “Yellow,” I’d be coating it with super glue or something. He must have the patience of Job to fiddle with all those little bricky thingys, I’d be pulling my hair outand tossing them through a window. He must be a very nice calm man. I gather it’s almost a Zen thing with him. It would have to be to devote that much time to it.